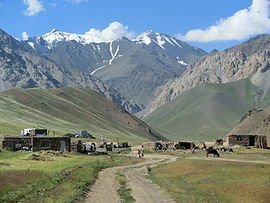 The Alay or Alai Mountains (Kyrgyz: Алай тоо кыркасы; Russian: Алайский хребет) constitute a mountain range that extends from the Tien Shan mountain range in Kyrgyzstan west into Tajikistan. It is part of the Pamir-Alai mountain system. The range runs approximately east to west. Its highest summit is Pik Tandykul (Russian: пик Тандыкуль), 5544 m. The southern slopes of the range drain into the Vakhsh River, a tributary of the Amu Darya. The streams that drain the northern slopes of the range are tributaries of the Syr Darya, and empty into the Fergana Valley to the north of the range. Some sources seem to use the term for the whole southern curve of the Tian Shan corresponding to the southern border of Kyrgyzstan. ^ a b Атлас Кыргызской Республики [Atlas of Kyrgyz Republic] (in Russian). Bishkek: Academy of Sciences of Kyrgyz SSR. 1987. p. 156. This page was last edited on 18 February 2019, at 20:18 (UTC).